Volunteering | Modified k9 Inc.
Below is a list of areas we're currently seeking volunteers for. In time we will be adding to the list. 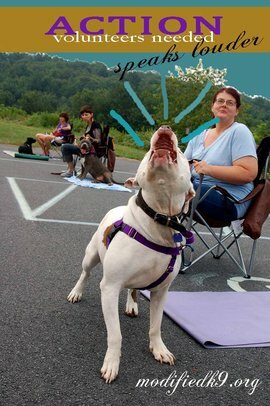 Thank you for wanting to make a difference in the lives of our beloved pit bulls. - We are currently seeking venues for our educational events. - We are interested in event venues located in the Pennsylvania, New Jersey & New York areas. Karen at mk9karen@hotmail.com for more details. - We are currently looking for volunteers for our shelter dog program. - Meet up several times during the week to meet with your paired up shelter dog. - To learn more about the importance of this program please see our SHELTER DOG PROGRAM page. - Email us at modifiedk9@Hotmail.com to work with shelters in Luzerne & Lackawanna County PA.
- We will send you a detailed email on how to get started..